There are countless tales of talented young racing drivers who, for a variety of reasons, did not make the grade at a professional level. They show well in the lower reaches of the sport but seem to lack something – talent, money, determination – that prevents them from making it to Formula 1. For all their effort, they're left only with memories of past glories, a few old trophies gathering dust, and stories of that time they beat a future star. In this respect, Roy James's life story is far from unique. The London-born racer certainly possessed some ability, and could claim to have beaten Jackie Stewart on at least one occasion during their younger days. But James did not progress into the higher echelons of the sport, while Stewart went on to become a three-time world champion – and this is where the story takes an extraordinary twist. Because while Stewart was winning his trio of F1 titles, James was sat in a prison cell dreaming of the grand prix life and pondering what might have been. His abilities behind the wheel weren't solely reserved for the race track: James was also a criminal getaway driver who was sentenced to 30 years for his role in the notorious Great Train Robbery. Born in 1935, Roy John James was a silversmith by trade and had worked at Harrods. He was also a handy sportsman who is said to have had a trial for Queens Park Rangers and excelled at waterskiing, before taking up competitive go-kart racing in 1960. Having discovered a passion for speed, James moved into single-seaters in the early-sixties, buying a car that belonged to the great Jack Brabham. The Australian was a two-time F1 champion at this point, as well as a burgeoning constructor, so purchasing one of his machines would not have been cheap. This considerable investment was funded by James' other career: crime. In later life, James is said to have excused his criminal exploits as something he did to pay for his true passion of motorsport; the story of a young driver whose talent goes unnoticed due to a lack of financial support is certainly not uncommon. However, his version of events does not tally with the fact that he was already working as a getaway driver before taking his racing interests to the next level. James worked for the South-Western gang, run by Bruce Reynolds, a man with connections and interests in the motor racing world besides James. The gang carried out heists in their native London, the south of England, and even across the Channel in France. In November 1962, James – who went by the unflattering nickname "Weasel" – was one of two getaway drivers hired to work on a heist at Heathrow Airport. The other was Micky Ball, who was subsequently arrested and imprisoned for his role, though he didn't identify his fellow driver. James is believed to have used his payment from this heist to buy the car from Brabham. 1963 was a big year for James, both on the track and as part of the criminal scene. Driving in Formula Junior, he won a considerable number of races (including some that featured Stewart). Motor Sport magazine recorded a "tally of some 16 wins in [Formula Junior] and [Formula] Libre events and 11 fastest laps." This in itself is enough to mark him out as a driver of some ability, though it must be mentioned that the top British talents of the day were more concerned with winning races (and the associated prize funds) across Europe. The target was an overnight train heading from Glasgow to London. A little after 3am on August 8th it was stopped by a rigged signal near Ledburn, a hamlet in Buckinghamshire. The driver was attacked and knocked unconsciousness, after which James helped to decouple the carriage, a skill he had spent months developing. The necessary coaches were moved down the line. Here the thieves broke into the area containing the bank notes and passed the money down in a human chain, with 120 of the 128 sacks inside removed. Such was their professionalism, the gang left when their allotted time was up, rather than trying to remove the few remaining bags. In total, they'd needed only half an hour. When the loot was loaded, James took off in one of two Land Rovers bearing the same plates: BMG 757A. He would have been disappointed by this, preferring to pilot Jaguars for getaway duties, though the sight and sound of an E-Type roaring around the backroads would have been unnecessarily conspicuous. So, while Stewart's most famous drives took place in F1 machinery on the world's greatest circuits – at Monza, Monaco and the Nurburgring – James' defining moment was in a Land Rover, on the darkened roads of rural Buckinghamshire, as he raced towards the gang's hideout. After reaching the farm they had bought to lay low in, the crew were forced to disperse earlier than anticipated after learning that the police were employing dragnet tactics to scour the area. After departing the farm, James is said to have visited the wife of Micky Ball, his fellow getaway driver who had been jailed the previous year, to deposit several thousand pounds as a thank you for staying quiet. He had fled back to London (at high speed, we must assume). A few weeks later he was finally arrested following one final race – this time on foot, across the rooftops of St John's Wood. James was linked to the crime by fingerprints found at the farmhouse hideout. Along with the other main perpetrators, he received a 30-year sentence for his involvement. Sometimes romanticised, the trial judge more accurately summed the Great Train Robbery up as "a crime of sordid violence inspired by vast greed". For those working on the train that night, it was a hugely traumatic experience. Perhaps, had they not been so violently attacked, it could have been considered an act of great daring, but the suffering it caused train driver Jack Mills and his secondman David Whitby paint the robbery a very different colour. Despite the long stretch he faced, Roy James' involvement in motor racing extended beyond his early exploits. Released in 1975 after 11 years in prison, he attempted a comeback, though this was extremely ambitious given his age (40) and time away from the track. Nevertheless he tried, but a heavy crash that resulted in a broken leg effectively ended any faint hope of succeeding in the sport. He did eventually find a way to leave his mark on F1, however. Among his fellow robbers, Ronnie Biggs went on to find particular fame after escaping from prison and eventually settling in Brazil. 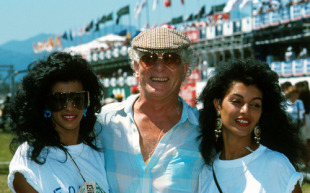 Never shy of attention, Biggs became a frequent visitor at the Brazilian Grand Prix when it was staged in Rio; there are photographs of him on the grid at the 1989 race, which was won by fellow Brit Nigel Mansell. But Ecclestone does admit to having an involvement with James after the getaway driver's release from prison. James, he says, asked him for a job at the Brabham team, which Bernie purchased in 1972. He said no, but: "Instead, I gave him a trophy to make... [It's] still the trophy we give to the [best grand prix] promoters every year. He made it. The recipients don't realise that." With his motor racing dreams over, James' life took a number of unhappy turns. In 1983 he was involved in an attempt to import gold without paying excise duty, a scheme that also involved fellow train robber Charlie Wilson. He was acquitted, but soon found trouble once more. James had married a woman 30 years his junior, with whom he had two children, but the relationship failed and he was awarded custody. However, he was expected to pay his ex-wife a large financial settlement. Having failed to do so, he became involved in an argument with his former father-in-law. James pulled a gun and shot the man three times, leaving him badly injured. There was no instinct to run this time: James turned himself in to the police. He was sentenced to six years for attempted murder, but while in prison his heart began to fail, requiring triple by-pass surgery. Partly because of this he was released early, in 1997, but died that August from heart failure. James was 62 years old. Despite the criminal aspect, it is hard not to see James' life as one that was tinged with tragedy. Like many other young drivers he had dreamed of competing in Formula 1 – and was not without some ability – but his determination to get there as quickly as possible led him down dark alleys. That desire to be a grand prix driver lasted through his decade in prison, when he must have spent countless hours dreaming of Monte Carlo and Monza, places a world away from the confines of his cell. Released on good behaviour, fate intervened in the form of a serious injury that thwarted his comeback. Thereafter he fell back in with his criminal cohorts, embarked upon an unhappy marriage, and found himself on the wrong side of the law one final time. Whereas Ronnie Biggs disappeared to Brazil and became a notorious celebrity, James sunk into obscurity and, eventually, oblivion. Though he is by no means the only man to break the law in pursuit of motor racing glory, no other grand prix hopeful can claim to have been involved in the crime of the century.